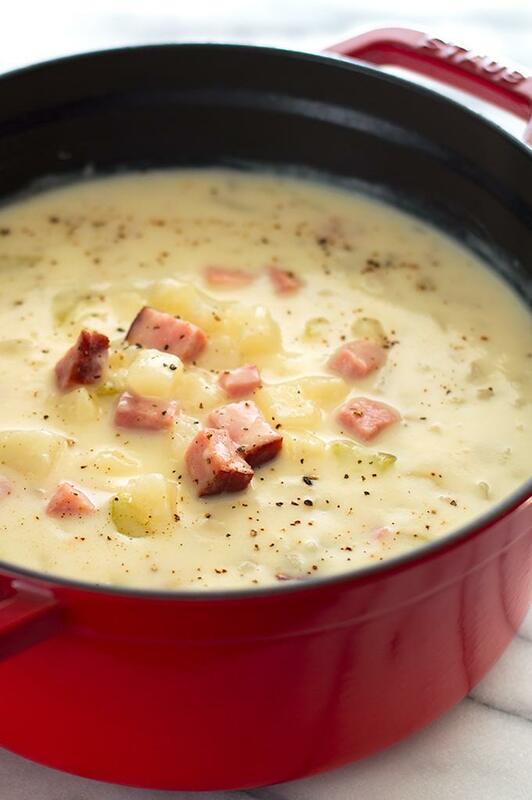 This healthy ham and potato soup is pure comfort food in a bowl. Easy, fast, and low-calorie, it’s one of my favorite busy weeknight meals. Have you seen that Campbell’s soup commercial with the sick guy lying on his couch trying to get his partner to make him soup? He tells her that his mom always used to make some for him when he wasn’t feeling well, and for a moment, it looks like she’s going to do it, but instead she just throws a phone at him, tells him to call him mom, and leaves him to wallow. I laugh SO hard, every single time I see that commercial, and I have no idea why, because I’m totally that person who makes soup for sick people. Feeling sick? Here, let me bring you some soup. And if I’m bringing soup, I’m probably bringing this one. 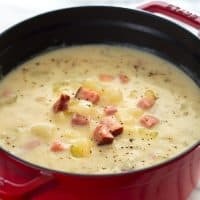 Like my Peasant Chicken Soup, this surprisingly healthy Ham and Potato Soup is another of the early recipes I learned in college. It saw me and my friends through many an illness and late-night study session. It’s perfect for what ails you because it’s pure comfort food. Ham and potatoes in a bowl? That’s like a hug from the inside. And the nice thing about this soup is that it’s deceptively easy. Sure it looks gorgeous and complicated, but once you cut the veggies and put them on to boil, all you really have to do is make the roux, stir in the milk, and watch the broth go from clear to creamy and delicious. 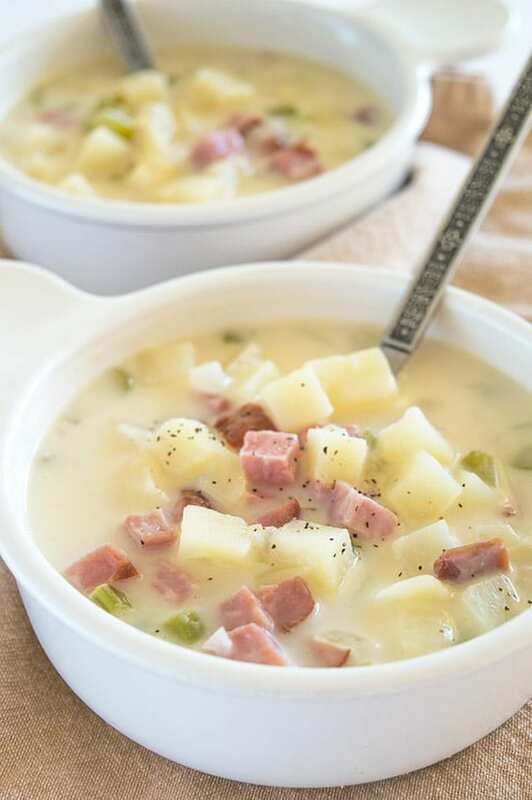 Throwing this together for a sick friend or a busy weeknight dinner takes all of a half hour, and when you’re done, the result is the best damn healthy ham and potato soup you’ve ever tried. Looking for more Easy Weeknight Meals? Try my Tri-tip in the Oven, No-Fuss Beef Ribs, and Broccoli Chowder. 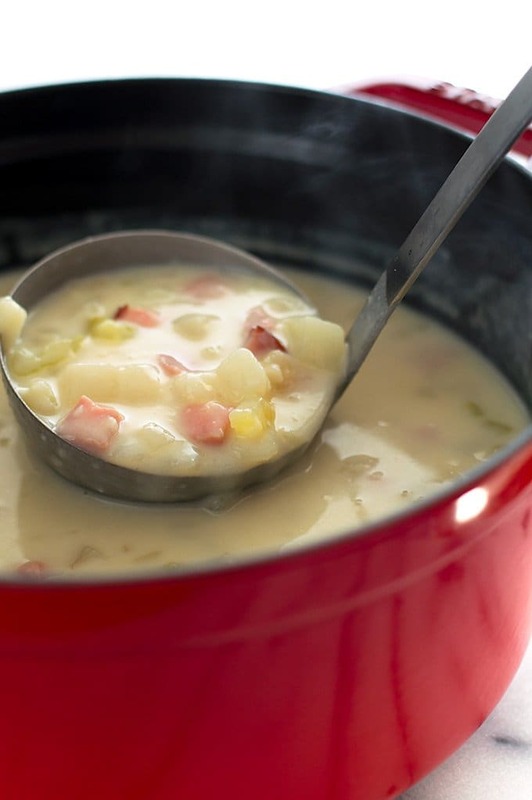 In a large pot, combine potatoes, ham, celery, onions, and chicken broth. Bring to a low boil and cook over medium heat until vegetables are fork-tender, 10 to 15 minutes. In a medium saucepan, melt butter over medium heat and whisk in flour. Cook, stirring constantly until flour is golden, about one minute. Slowly add in milk, continuing to stir so that no lumps form and cook until mixture is thick, about 5 minutes. Pour flour and milk mixture into the soup and stir. Add pepper, and salt to taste. *If you don't care for honey ham, you can use regular cooked ham. Small Batch Instructions: This recipe halves cleanly. 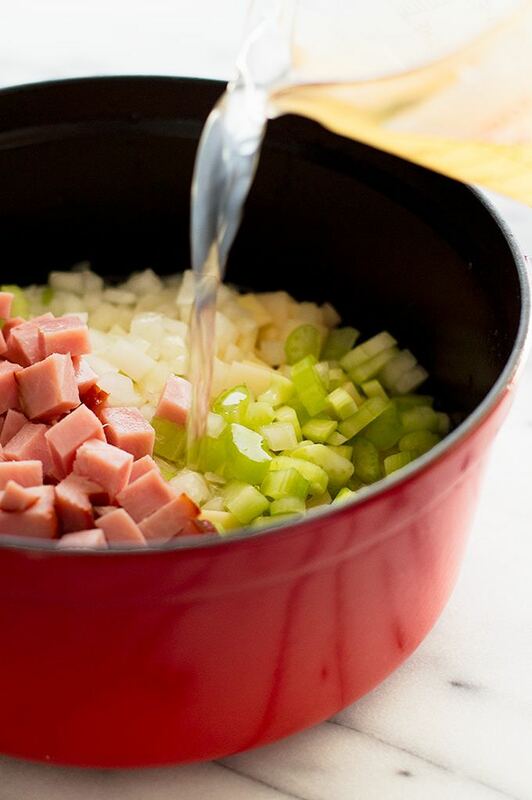 Make-ahead Instructions: Ham, onions, and celery can be cut up to two days in advance. Potatoes should be cut just before cooking to avoid browning. Freezer Notes: You can freeze this soup–it will keep up to 4 months in the freezer, but I was not a huge fan of the texture of the potatoes once my test batch defrosted. I probably wouldn’t freeze this soup again.